When I was eight, my mother taught me knitting. Every couple of years, I would get in a knitting mood and make something: socks, a shawl, a jersey. At some point in time, when I was about twenty-five I believe, I also got interested in crochet. From crochet to lace is a small step. Before I knew it I was reading all there was to know about lace making. I taught myself bobbin lace and lace knitting. 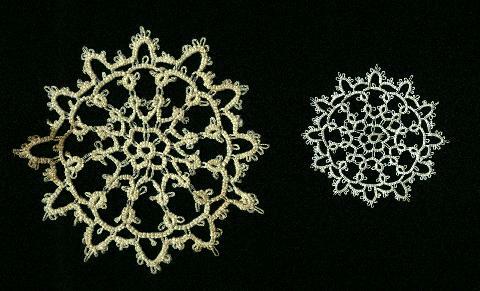 When my mother saw I was interested in lace, she showed me a lace technique that she had practiced when she was pregnant with me. There were complications with the pregnancy and she had to lie flat for weeks. A friend of hers then taught her to tat, because that was about the only thing she could do in the position she was in. I still have the baby bonnet that she tatted for me. Anyway, my mother showed me the knot and off I went. After months of practicing I finally got the hang of it. Shortly after that, I served in the Dutch army - where I just continued knitting and tatting. My fellow soldiers were very helpful in winding balls from the strands of wool I brought. Meanwhile, my mother had contacted a publisher of a craft magazine. When I was on leave, she told me, and also told me that they hadn't called her back yet. So I took the phone and gave them a call. They told me tatting was a lost art, and that they had a cupboard full of tatting designs that they just didn't know what to do with. So I said to myself: we'll see about that alright - and called another magazine. Quite in contrast, they were very enthousiastic and came to my home (after I left service) for an interview and took pictures. It all appeared in 1983 in a magazine called Ariadne (which no longer exists); see my Ariadne Gallery for some pictures. I also published a lace pattern for a knitted doily in this magazine. Since I started out with tatting, I have made more than hundred tatting designs, of which approximately fifty are in one of my three books. I still tat, as far as time allows. Recently I took my very first tatting project - also my first design, and tatted it again. It is a small coaster called Aurora. The result is below. The two items have been done twenty-five years apart. The first one I did using crochet thread No. 5 (I think); the second one is in DMC Cordonnet Special No. 20. It has the first split chain I ever did (can you find it?). Oh, besides tatting - I have a lovely wife and two children, a boy and a girl. I work as a software engineer. Right now, most of my free time goes in squash, jogging and playing keyboard.